Alpine Arnica Cottages situated on the Great Alpine Road are the ideal setting for a romantic weekend or relaxing getaway. Perfect for couples, our two newly built cottages feature all you need in a mountain retreat. Curl up on the window seat with a good book or take in the beautiful views from your own verandah while enjoying the scenery. Watch the sun rise and set over the mountains, soak up the fresh air and enjoy! Cottage 1 features everything you need in a home away from home. The open plan kitchenette is well equipped with quality appliances and electric hotplates to whip up a romantic dinner for two. The spacious lounge and dining area with TV/DVD/CD is light and airy, perfect for relaxing after a day exploring or hitting the slopes. You will love the views of your manicured gardens and mountains from the comfy window seat. The bedroom features a queen bed and lovely views of the mountain surrounds. There is also plenty of hanging space with built in robes. The lounge is equipped with a sofa bed if necessary. Your cottage is centrally located, close to quality hotels & cafes serving meals highlighting local produce. This is easy living, just the way you want it! 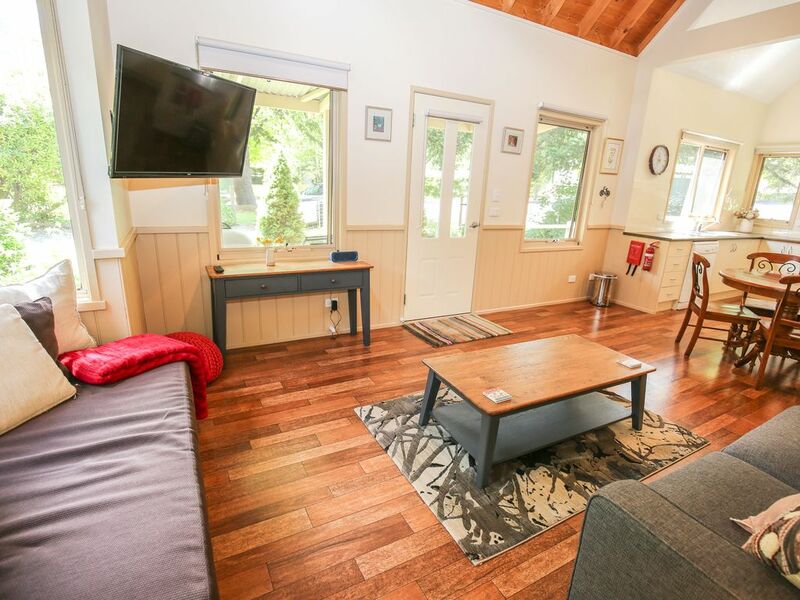 Alpine Arnica Cottages are the perfect place to unwind and enjoy the magnificent natural surrounds that Harrietville offers. Perhaps you could stroll down to the old swimming hole for a dip and a BBQ of fresh fish you've caught. Make your way back past the ice creamery for a home made ice cream, then cross the road and explore the new gallery. While your at it check out the historical museum before stopping off at one of the cafes for a fantastic coffee. As the sun sets, relax on the balcony of one of two hotels and sip a glass of local wine. And of course, there is plenty to explore out of Harrietville with Bright just 25kms away. Some of Victoria's most acclaimed wineries and restaurants are within your reach. Then you can visit Milawa, Beechworth, even take the easy drive to Falls Creek. Harrietville is also the ideal base for your skiing holiday. We can arrange all your gear hire and travel before you arrive, you just need to get fitted! The snowball express departs daily to Mt Hotham and you can get all your gear here before you go. Falls Creek and Mt Buffalo are both an easy drive. There is plenty of great places to eat and play every night with affordable meals and good old fashioned hospitality. That means you save time and money! What more could you ask for? A fold-out sofa bed is available for 1 extra guest.